Everyone knows plants clean and purify air. Naava has now developed and patented a technology that purifies air over a hundred times more efficiently than regular plants. These smart green walls are becoming increasingly popular as urban areas expand all over the world. Impure indoor air is unpleasant at best and a health hazard at worst. Plants and green walls have commonly been used to clean and purify air. And most people find them pleasant to look at too. 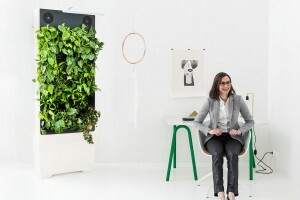 Naava has developed a unique technology that allows the remotely controlled green wall system to purify indoor air with remarkable efficiency. The potential market for the product covers all urban living and working environments around the world. 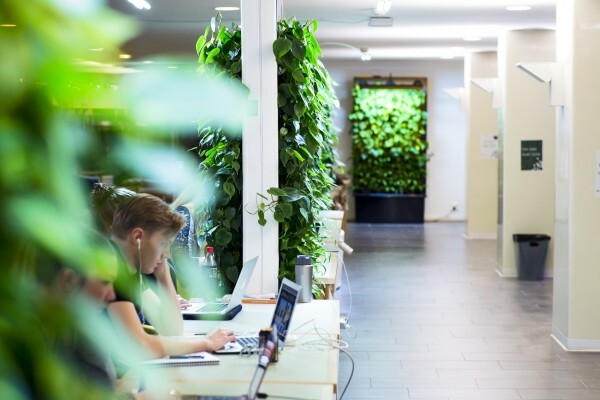 The innovation is based on a personal mission: suffering from bad indoor air in his student apartment Aki Soudunsaari, joined by Naava’s co-founder Niko Järvinen, started testing plant based air purification methods. After years of development, they invented the technology that is now the basis of Naava’s green walls. The Naturbo technology developed and patented by Naava is designed to purify indoor air with microbes. Similar processes are used in wastewater treatment facilities, where microbes help to purify contaminated water. Naava’s green wall consists of plants planted in inorganic growth medium. Air is sucked through the plant roots whose microbe population breaks down impurities in the air and transforms them into plant nourishment. Naturbo is the only air cleaning solution that adapts to the surrounding climate and grows a unique microbe population that can use the surrounding chemicals as its nutrients. Hence, it works in any living or working environment and is able to break down indoor air chemicals over a hundred times more efficiently than regular plants. Soil is not needed as the plants are grown using a combination of hydro- and aeroponics. Representing true smart technology the green walls are monitored and controlled remotely at all times. Naava’s growth is sped up by the rapid urbanisation all over the world, as people in urban environments spend 80–¬90% of their time indoors. Bad indoor air is a significant problem in offices, public premises and often also in apartments. Tightening energy efficiency requirements have in many cases led to decreasing indoor air quality. Naava’s green wall is an excellent solution for this. Large cities around the world are the company’s target market. Potential expansion to Sweden, for example, would target Stockholm particularly – not the whole country.